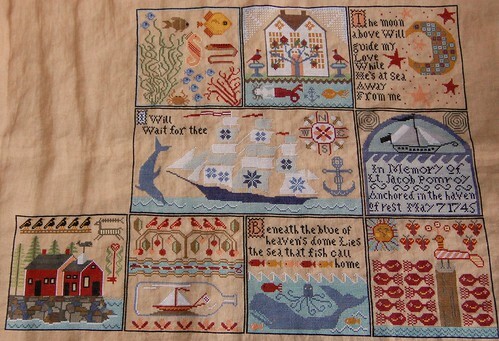 Nicole's Needlework: Shores Block 9 Finished! I only have two blocks to go now! Many of you may have seen Paulette's gorgeous pictures of her recent visit to Shepherd's Bush. It's definitely my dream to visit the shop one day. It has been for about 14 years now! Anyway, I noticed their version of Long Dog Sampler's "The Token" in one of her pictures and loved it. I asked around and found out that they used Gloriana Rosewood. I had started The Token a long time ago, but didn't get far. I ended up using the linen for something else. So I decided to restart it the other day using Rosewood (I had a skein in my stash and ordered a few more, hopefully it matches). I don't know why I'm on a Quaker kick lately. I have yet to finish a large Quaker sampler, but oh well, stitching is supposed to be fun, right?? :) Write soon! Well done on finishing another block, you'll soon have a huge happy dance! I love your restart of the Token, it looks so much warmer and richer than your original start. Wonderful WIP. Have to agree, love the new start on The Token. The thread colour is gorgeous. I love this block. You are so close on this one! Beautiful thread choice on the token! Congratulations, Nicole, it is GORGEOUS! Congrats on another block finish! You're almost there! Wow, Nicole - you're in the finish lane .. woo hoo! Such a gorgeous piece. Where will you display it? Your Shores is looking fabulous Nicole, congratulations on finishing another block! If you need any more Rosewood, give me a shout - I have quite a bit and am not using silks much any more. You are on the home stretch with Shores!! WTG!!! I have mine waiting to be put in the rotation to stitch...I cant get past the rocks..but hearing you say it was your fav block so far, makes me want to pull it out and finish that block!! Love your new Shores block! So colorful! And your new start...FABULOUS! Enjoy Nicole! The Token looks really nice with the dark, rich color! Both are beautiful! I love that block in Shores as well -- gotta love the red house. :D And your Token is pretty in that dark red! Woo hoo... it won't be long now and you'll have Shores finished. I love thread you've chosen for The Token. Congrats on finishing the block - lovely stitching! Funny, I had fun with those rocks and they went quite quickly for me. I can see why that block is a favorite; it looks fun stitch (other than the rocks, which drove me crazy in block 1!). Your Shores so pretty and it's exciting that it's almost done! Pretty colors for your restart. Congratulations on finishing block nine. Only having two blocks left is a huge motivator getting them stitched up asap, yes? I'm looking forward to your happy dance. I like your re-start on The Token. 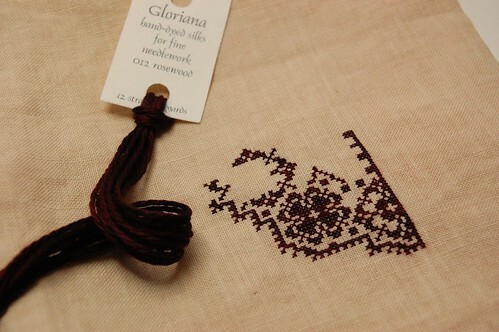 I haven't used Gloriana silk before, but it looks like it would be a dream to stitch with. Congrats on finishing that block. You're so close to yet another HRH finish!!! And love love love that Rosewood silk. Oh that is a lovely block. Thanks for sharing your beautiful stitching! Good luck on your Long Dog Rosewood adventure. Yoohoo!! Congrats on finishing another beautiful block. The whole piece is gorgeous. I love this block too! 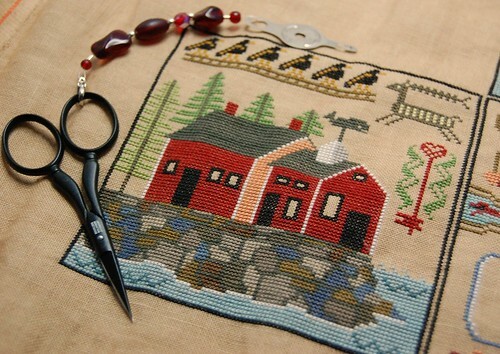 your stitching is always so neat and the colors of Shores is sooooo pretty! The Quaker start is lovely. Nicole, The Shores is just looking great !! That block is one of my favorite ones also.... I think it is the red. Yeah, the rocks are a pain, aren't they? You will be all finished soon !! Congratulations on finishing another block - that was my second favorite block (my favorite was the blue house above it); I know what you mean about the rocks taking a long time to stitch!